If you love the look and class of slate roofs but have either structural weight bearing or cost restraints, a composite slate roof might be just the thing for you. You will get the attractive look of slate without the structural weight and at a fraction of the cost. 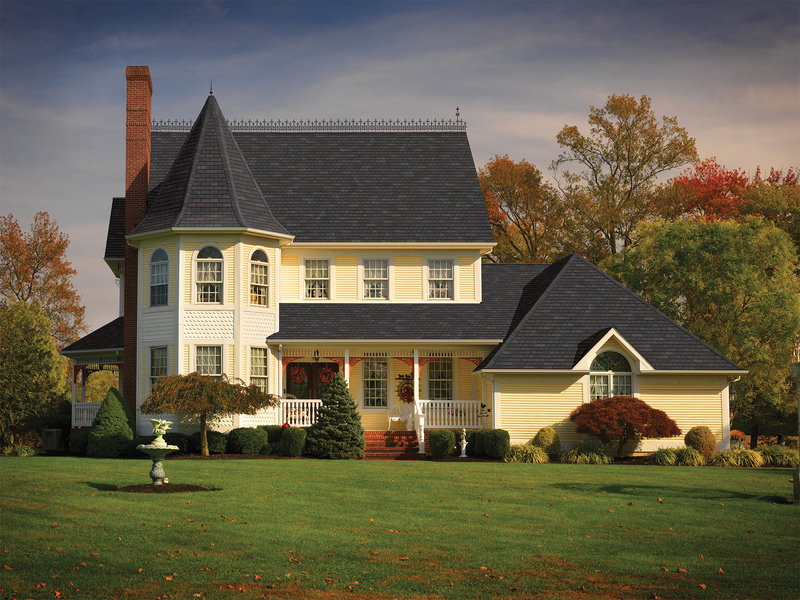 Composite slate roofing shingles are made from one of two materials: plastic roofing or rubber slate. Plastic alternative slate tiles are made of a nonporous plastic, and they look like slate tiles but are lighter and less expensive. Rubber slate is made from recycled tires and looks surprisingly like natural slate and has a similar durability. With slate alternative shingles, you’ll get the curb appeal of slate at a fraction of the cost of natural slate or wood shake. 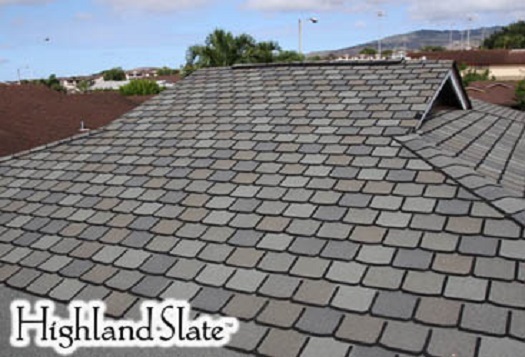 Slate alternative shingles come in a variety of colors, such as the cool grey Antique Slate, Royal Slate with undertones of burgundy and blue, earth Emerald Green, and the ever neutral English Grey. 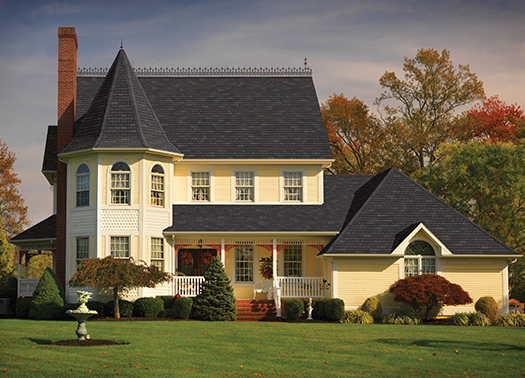 Slate alternative shingles have the durability of slate with the convenience of composite shingles. 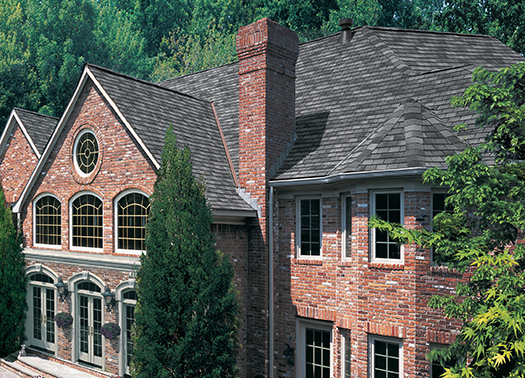 Slate alternative shingles are fire resistant, with a Class A rating. Stain resistant slate alternative will keep your roof looking new for decades. No more algae streaks ruining the appearance of your home. Slate alternative roofs are installed with a roof deck protective underlayment for extra waterproofing. A leak barrier layer is also under all slate alternative shingles, adding even more water protection. Call 215.259.3095 to find out more about Slate Alternative Shingles or click here for a Speedy Fast Quote. The images here are of a recent slate alternative project of ours in the city of Bethlehem. 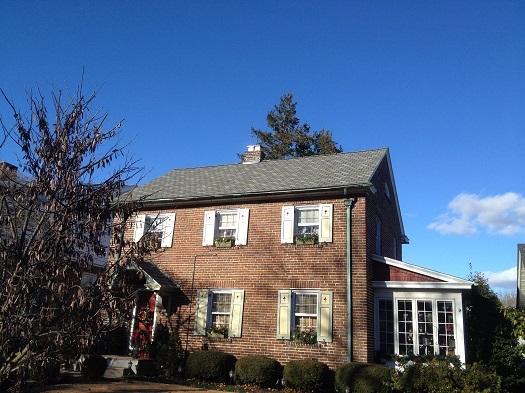 This very well-kept colonial had a damaged slate roof in need of replacement and the owner decided for slate alternative roofing (Highland Slate Shingle in Smokey Quartz). Even up close you can hardly tell the difference and we managed to keep the copper gutters on the house. If you are looking for an affordable alternative to slate, you’ll be tapping into some of the advantages that slate alternative offers. The character of your fine home doesn’t need to be compromised to get the advantages of a composite roof. The great thing about slate alternative is that you get the advantages of a composite shingle without compromising the appearance of your roof. A classic, historic home can get a new roof for a fraction of the cost of a natural slate roof. An alternative slate roof will cost you much less than a natural slate roof will. This cost transfers to repairs and tile replacement as well. Of course, with alternative slate, you’ll have fewer (if any) broken slate tiles and so the maintenance cost is reduced on that end as well. When you do have to replace a tile, you can get it in the same color as the rest of your roof so your roof will not be slowly turned into a patchwork of colors. Another way to save money with a slate alternative roof is to check with your insurance company. Your premium might go down! If you have an aging home with a natural slate roof but are worried that a new roof could stress the aging supports, a slate alternative roof will take the weight off, literally. At a fraction of the weight, an alternative slate roof can save structural stresses from causing damage in your historic home while still maintaining the look and quality of a slate roof. If you are looking for an affordable alternative to slate, CONTACT US.